Great...we're here to get you up and running once a few initial steps are completed. So what describes your role? 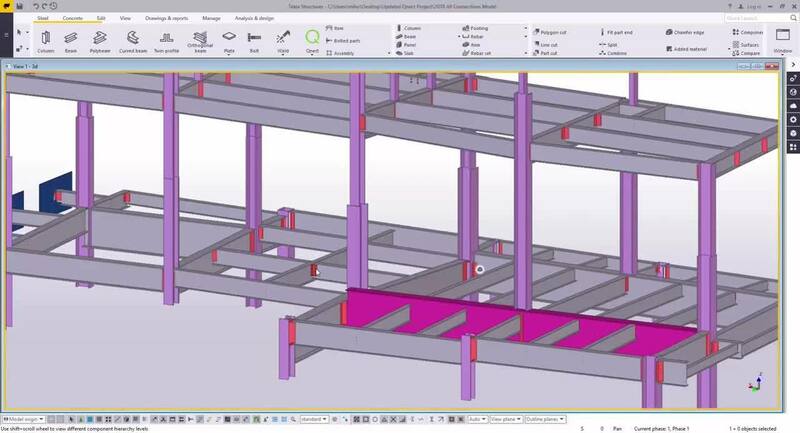 This 12 minute video, created by our partners at Trimble, shows how Qnect and Tekla Structures work hand-in-hand. This describes the procedure for running Qnect within your organization for the first time. Call 413-387-4375 or complete this form so we can get you in the system and started. Once we get your information, we will setup your company in our system. Qnect will setup the first person within your company - most likely this is you. We refer to this person as the Company Administrator. The Company Administrator has the ability to add other people within your company as needed as described in the Existing Users section below. 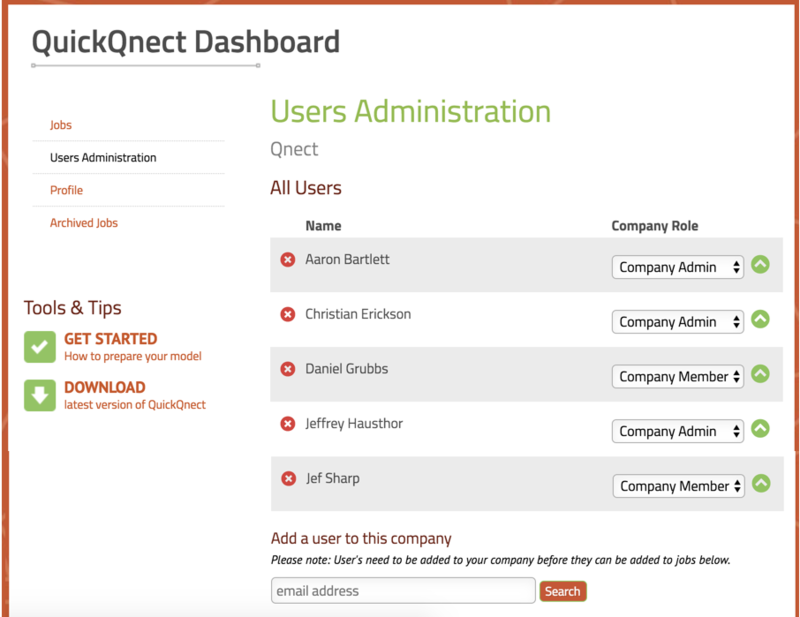 Once we have completed our step, the Company Administrator will receive an automated message from our system with login information to the Qnect Application. The Company Administrator can now Sign In on our website which will bring them to the Dashboard. On the upper right you will see the Sign In link. Click on it. Fill in your email address and the password supplied to you in the automated email you received and hit the Sign In button. 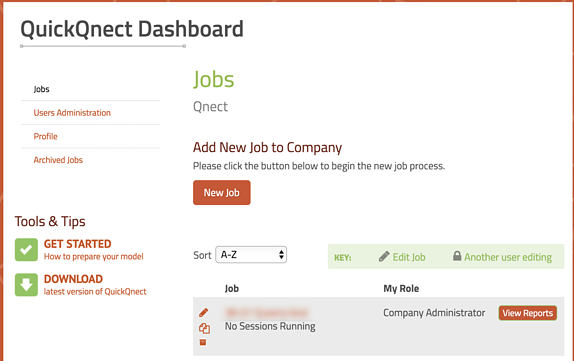 Once you login, you will be brought to the Qnect Dashboard on the Jobs page. At any time you can return to the Dashboard on the top right of the screen. The menu on the left brings you to different pages within the Dashboard. At the bottom left of the screen is the DOWNLOAD link. When you hit this link, the install program will be downloaded within your browser. NOTE: you must exit Tekla Structures prior to installing the Qnect software. Follow the simple steps to install. This adds the buttons 1, 2 and 3 to your Tekla Structures environments. Review the GET STARTED list just above the DOWNLOAD Link on the lower left. It lists items that the user should perform on the model prior to running our software. The Dashboard gives you the ability to see the list of Jobs that have been setup for your Company. You will automatically have the Sample Preferences Job on your list the first time you login. You can at anytime add a New Job by clicking the New Job button at the center of the web page. You will see three icons next to each job listed. Clicking on the Job Name or the pencil icon opens the preferences to edit. Clicking on the copy icon will copy all the job preferences for you into a new job name that you specify. Clicking on the archive icon will archive the job for you once you are done with the Job. Since your company has an account and already has users, you'll work with your Company Administrator to set you up. You can start by downloading the application per the instructions above. You can also easily share this step-by-step PDF to your Company Administrator. If you need help to identify your Company Administrator, please contact us. The next item on the left menu within the Dashboard page is the User Administration. This page allows you to Add, Delete and Modify the security level of new users to your company. In the center of the page, you will see a list of all users within your company. Each user listed has a red X next to their name, that is how you delete the user. Each user has a Company Role. Company Member has the ability to be assigned to Jobs. Company Admin in addition to Company Member abilities also can Add, Delete and Change the Company Role of users. Enter their email address under the list of users and hit the Search button. If the user is not already in our system, the system will ask if you would like us to send them an invitation. If the user is in our system, it will add that user to your company. Underneath the users in the company section is the Jobs access list. This shows the list of jobs in the company with a list of users that have access to that job. 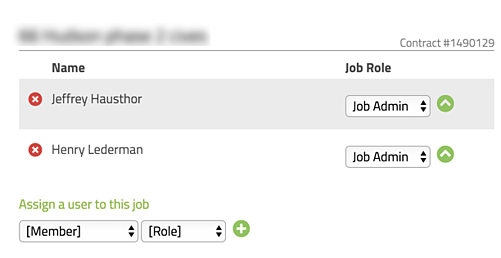 To add a new user to this job, you would choose a Company Member from the dropdown list and then choose the Role. Role can be Job Detailer that can run Buttons 1, 2 and 3 in Tekla. Role Job Admin can do anything Job Detailer can do and can also update the Job Preferences. We bill your project based on the pricing options that you want to use. For the first couple of projects, we walk through the process with you as you learn about Qnect. We have found that this not only helps you in the long-run but also helps us as you are able to get up and running much quicker than trying to go at it alone. Please, get started now as a First Time User here or contact us using the form below for more information on how our billing and pricing works. ...taking a few minutes to review this video or read this page to understand the steps needed to get started. There are a few steps that Qnect needs to take to get you going. We will contact you to set up a time to help with your on-boarding. The most successful customers usually work with us on their first few projects.